The new-look 2016 Great Britain Fastpitch League (GBFL), featuring separate women’s and men’s leagues instead of the previous jumble of women’s, men’s and mixed teams playing each other, got off to a great start with an exciting day’s play on Saturday 30 April at Farnham Park. This year’s GBFL has been organised less around established teams and more around players, with the aim of creating new teams that can be competitive with each other. So the 2016 GBFL Men’s League consists of five teams – Green, Black, Red, Blue and a team called Filinvest International, consisting mainly of players from a Filipino community based in Yorkshire. 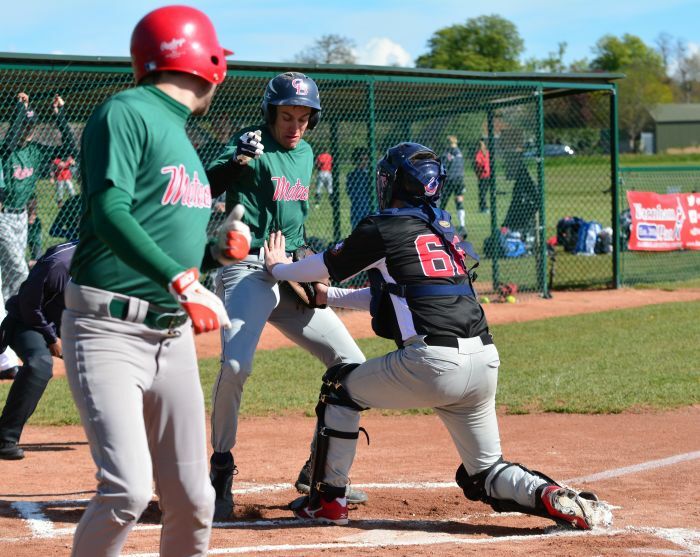 The other four teams are made up of players – including members of the GB Men and GB Under-19 Men pools -- who have signed up to the London Meteors Fastpitch Club and been drafted into teams designed to be as even as possible. Meanwhile the Women’s League consists of two established fastpitch club teams, the London Angels and Heyford Diamonds, and two other teams – the Sox and Lions – made up of all other players who registered for the league, including players currently in the GB Women, Under-19 and Under-16 pools. It was a cold but sunny morning as the players arrived at Farnham Park and began to look for their teams, meet their teammates, greet their coaches and pull on their team shirts. A league that had existed so far largely on paper, emails and spreadsheets was quickly becoming a reality on the ground. For the coaches of the drafted teams, who knew some of the players assigned to them but had never met others or seen them play, it was a case of making quick guesses about line-ups and positions and then giving everyone playing time in Game 1 so they could assess what they had. And what they had varied hugely in age, softball experience, fastpitch experience and talent, ranging from a few 50-somethings to the exciting sight of a battery of 14-year-olds, Kristen Kohler and Caitlin Frank, just up from last year’s GB Under-13 Team, pitching and catching respectively for the Sox. And they weren’t the only recent U-13 players involved on the day. Any new players who want to join either the Men’s or Women’s League for the rest of the GBFL season should contact League Organiser Lee Grafton on: lee@circle-associates.co.uk. At the end of a long, tiring but exciting day, it was generally reckoned that the new formula for GBFL had been a success. The GBFL will play again on 7 May, 21 May and 4 June, with an Open Day for new players planned over the weekend of 23-24 July.